ChunSoft’s Mystery Dungeon series (better known as Fushigi no Dungeon in its native Japan) has been running for more than a decade and has become linked with other famous videogame brands such as Pokemon, Dragon Quest and Final Fantasy. Amazingly, despite the success of the franchise in the East, it has failed to register with most Western gamers, aside from the recent Pokemon Mystery Dungeon: Blue Rescue Team. 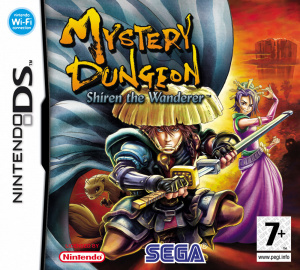 That is hopefully set to change thanks to Mystery Dungeon: Shiren the Wanderer. 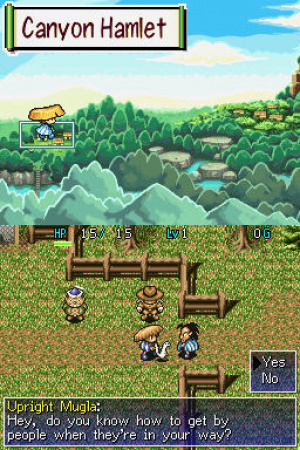 Essentially a remake of the Super Nintendo title that started the entire series, this quirky and unique RPG is a very different proposition from the likes of Final Fantasy III and other traditional Japanese role players. For starters, the storyline is a little on the light side, with hardly any character development and the most lightweight of plots tying it all together. 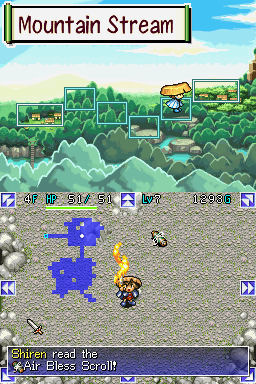 But to see this as a criticism is missing the point; Shiren the Wanderer strips away the many layers of needless detail that have been painted over the framework of the RPG genre and presents a game that is far more focused on core elements like exploration, statistics and item collection. 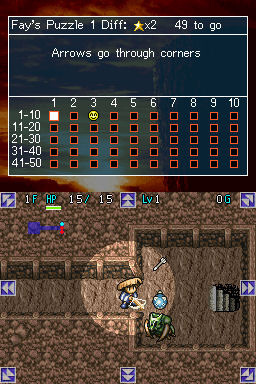 Starting out from a central town or safe spot, you have to advance through several floors of a randomly generated dungeon, engaging various enemies along the way. The action is strictly turn-based, with each footstep counting as one ‘turn’. Your character’s health replenishes as you walk but that doesn’t mean the game is a pushover – in fact, this is likely to be one of the most unforgiving RPGs you’ve ever played. When you die, you are stripped of all the items and money you’ve built up and sent back to the very beginning of the dungeon with your tail between your legs. This may sound like a recipe for extreme frustration, but it’s actually one of the aspects that makes Shiren the Wanderer so compelling; in most RPGs save points are generously spread throughout the game and if you happen to fail you can merely reload and start again. In Shiren the Wanderer you have to really consider what action to take. When your next encounter could spell certain death and a demoralizing demotion to the start of the dungeon, you tend to think more clearly about the challenge ahead. The dungeons themselves are randomly created so each time you play they are different; this can be seen as both a blessing and a curse. On one hand it keeps things fresh and encourages repeat play, but on the flip side it means that the actual level design is fairly basic, with no clever set pieces or design. On the whole the system works very well, and starting each level without knowing anything about the layout is refreshing. Progression through each floor of the dungeon is determined by how swiftly you locate the exit, but it’s not just about finding your way out in the quickest time possible. A fine balance has to be maintained between moving forward and building your character’s power. If you surge forward without picking up items and increasing your experience then you’re likely to come unstuck when you face some of the more demanding enemies later on in the dungeon. Levelling up is an essential part of most Japanese RPGs but here the items you equip are almost equally as important; therefore it often pays to explore every nook and cranny of each floor to find the best weapons and armour. Although the graphics have been improved from the SNES original, Shiren the Wanderer still noticeably lacks polish; 2D games have the potential to look truly stunning on the DS but this is noticeably lacking when placed alongside more accomplished titles like SquareEnix’s Children of Mana. The sound fares much better, with some nice tunes and atmospheric effects. 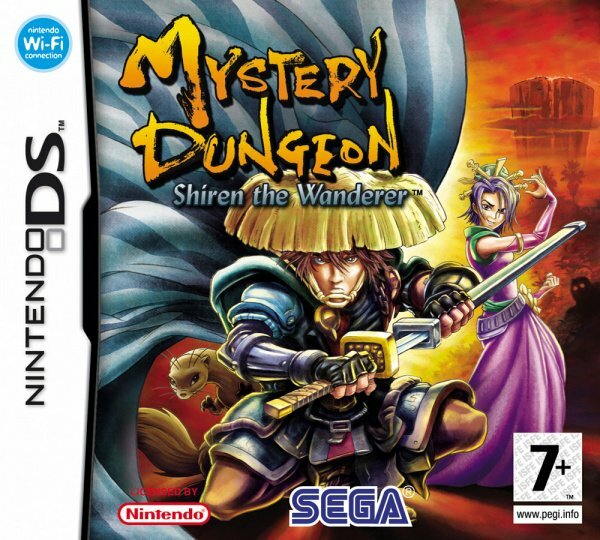 Shiren the Wanderer is very much an acquired taste and is difficult to recommend wholeheartedly. The unforgiving nature of the gameplay, coupled with the outdated visuals and lack of an involving plot make this a niche title and it’s unlikely to establish the Mystery Dungeon franchise as a best seller in the West. That said, this is one of the most pure RPGs currently available and if you allow it to draw you in, it has the potential to offer hours of addictive gameplay. Hmm... I am interested, I loved Pokemon Mystery Dungeon and it ranks as my favorite DS game so I should like this, right? Nice review, I can't believe I never heard of the DS version of this game until recently. One of the best titles on the DS. Once you get used to dying randomly that is.